The Fashionable Bureaucrat: Hey Sailor! I got a new dress and it has proven to be a popular addition to my closet. I like to look at the clothes in eShakti's overstock section and this jumped out at me and was my size so I took the plunge. Surprisingly there's no crinoline underneath it - the skirt just sticks out like that on its own! Sproing! Not entirely sure if these shoes work with it but I hadn't worn them in a while so I retrieved them from under the bed. They are quite comfortable. So… I am male and gay and have never ever ever had any desire whatsoever to drag (verb) at anytime in my life - Okay: That one period in the early 80s and I wanted to dress up as Annie Lennox but that's different. With that said, every once-and-awhile, if I walk past a nice women's clothing store and I see something I really like, I think "If I were a woman, I would wear that." My point? If I were a woman, I would wear those shoes. They are really wonderful. You, Madame, have very good taste in shoes and in garb. What a nice thing to say - great comment. Funny how strangers' comments can be so fulfilling. I adore your dress too - just fabulous! Those ARE beautiful shoes! I love your dress, too. You look great! 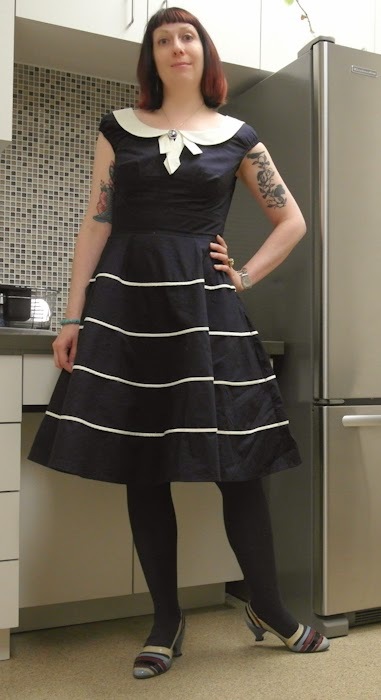 Love the dress, love the shoes, but the combination is even better than the sum of its parts. They definitely work together! They are pretty fab shoes! I love your blog and all of your looks-so unique and pulled together.